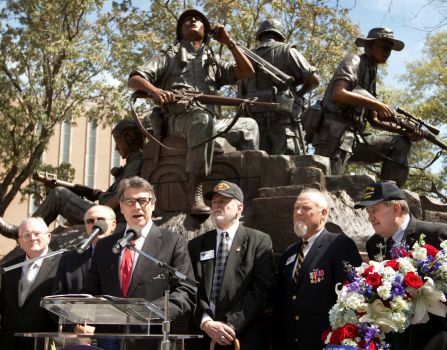 AUSTIN – The dedication of the Vietnam Veterans Monument at the Texas Capitol on Saturday, March 29, 2014, highlighted the pain, pride and solidarity of those who served in an unpopular conflict. “They fought, they bled, all too often they died for their country. When they came home, there wasn’t any parades. There weren’t any picnics. Instead they were treated with indifference or, even worse, with outright scorn,” said Gov. Rick Perry. Perry – an Air Force veteran who served between 1972 and 1977 flying C-130 tactical airlift in the U.S., Europe and the Middle East – formally accepted the monument on the state’s behalf from Robert Floyd, chairman of a committee composed of Vietnam vets who raised money for the $2.2 million monument and oversaw its production. State Sen. Juan “Chuy” Hinojosa – a McAllen Democrat who co-sponsored the monument authorization legislation with state Rep. Wayne Smith, R-Baytown, a fellow Vietnam veteran – said he “felt chills in my body” when the monument was unveiled. They came from all walks of life but became a family willing to die for one other, their nation and their way of life, he said. State Sen. Leticia Van de Putte of San Antonio, the Democratic nominee for lieutenant governor, spoke at the event, as did Lt. Gov. David Dewhurst, who is in a runoff with state Sen. Dan Patrick of Houston for the GOP nomination for the job. “We will always remember. We will always honor. And this monument allows us, for future generations, to learn,” said Van de Putte, who heads the Senate Veteran Affairs and Military Installations Committee. 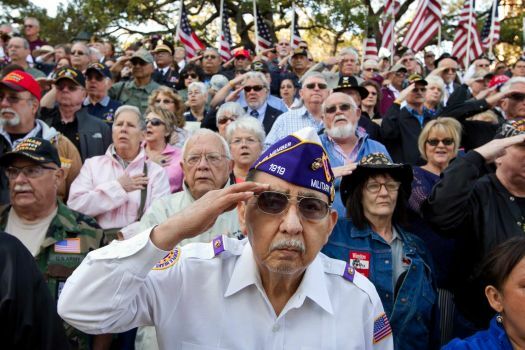 She cited heroes including two Medal of Honor recipients from San Antonio who were honored at the White House this month – Vietnam veterans Jose Rodela and Santiago Erevia. Erevia and his wife attended the dedication ceremony, and Van de Putte recognized them as the crowd applauded. Dog tags personalized for 3,417 Texans who died or were unaccounted-for are inside the monument. “You defined what it is to be an American, and what it is to be a Texan,” said Dewhurst, who served in the Air Force from 1967-70 and also worked in the CIA. 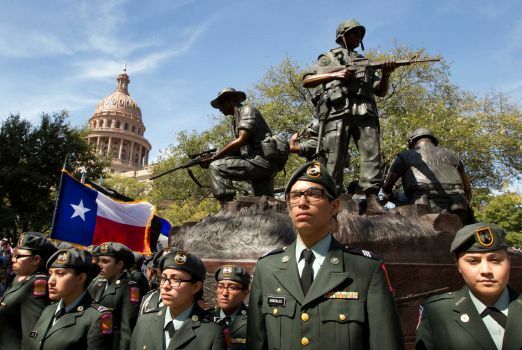 Members of the Memorial High School JROTC Minutemen Battalion from San Antonio participate in the dedication of the Texas state Capitol Vietnam Veterans Monument in Austin. Vietnam veteran Frank Cortez salutes during the national anthem at Saturday’s the dedication of the Texas state Capitol Vietnam Veterans Monument in Austin.